The red glowing button means the light is stepping down due to heat. Thanks! Ok I think it works very well then. More then happy with my new “compact searchlight”. A tip if you don’t want to undauntedly melt your holster – screw off the battery tube just so the o-ring starts to peak through under the head and the power cells loose their contact. Sometimes it feels like a hassel to click 6 times to lock the button. I use UI1, which means it’s also very unlikely that the light will come on in turbo accidentally. Me too. And turn the button in the holster where there is a lot of free space. OUT OF STOCKS! Does this means it is no longer in production? 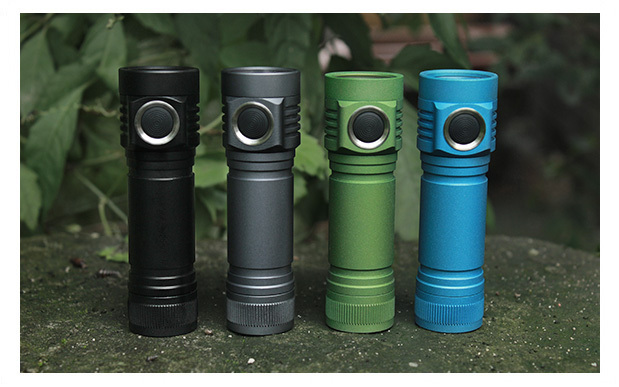 So is the D4 on int outdoor(well sold out )……………maybe temporary till the D1 orders settle. It’s a popular item, not easy to keep the supply high enough to meet demand. And I think Hank is busy with the D1 and other projects, so his D4 time is limited. As far as I know the M43 is still "in production", but I think that they have pretty much paused M43 production until they get caught up on D1 and D4 production. Mountain Electronics : batteries, Noctigon, and much more! What's new? I have had my M43 since January of this year and I LOVE it, i have come to find that UI3 is the best for me…….so heres my question. Is there a way to put Narsil M on this light and maybe still have some cool functions with the switch leds? UI3 is Narsil, but with three levels. If you “set” all three levels to low, then however you turn it on it will be in low, and available to ramp with a click click and hold. The Turbo is a available with a press and hold from any level, including off. The strobe and battcheck and other fun stuff are not as easy as Narsil, but still available. I love UI3, it is my favorite interface for all of my lights. I have had my M43 since January of this year and I LOVE it, i have come to find that UI3 is the best for me.......so heres my question. Is there a way to put Narsil M on this light and maybe still have some cool functions with the switch leds? There is no other firmware that will work correctly with this light. You would have to start from the ground up completely. I have mine set to low with one click, then with the double click it goes brighter, then again, then I can hold for turbo. nothing wrong with this UI, its just that narsil is so simple haha. Thanks for the info, Ill just have to stick with my 8 page instruction UI on this one haha. It looks complicated, but it’s one of those things that is very wordy to explain but simple in execution. I set up my Meteors so that Mode 1 is low, Mode 2 is high, and Mode 3 is medium. This may seem counterintuitive, but read on. Single click turns the light on in low. Double click moves to medium. Double click again moves to high. While the light is on, double-clicking will continuously cycle through the three brightness settings. A ‘fast then long click’ moves backward while the light is ON. Once you get comfortable with the operation, you can also use shortcuts to the three modes from OFF. At any time while the light is on, holding the switch activates Turbo until you let go and it returns to the mode you were in. This is one of my favorite features. Out of shear curiosity: Has anyone (maybe ToyKeeper) identified the used chips on the driver or has at least high-res photos of the driver where the markings are readable? I found this post on TLF where I can see the components or a photo on some russian site but neither A335 for the D1 component or VT1 are readable well enough or can be found somewhere. From the general circuit it looks like VT1 is the mosfet for the boost converter, D1 is the uC since it has pads for the switch and LEDS and D2 is some kind of OPV? 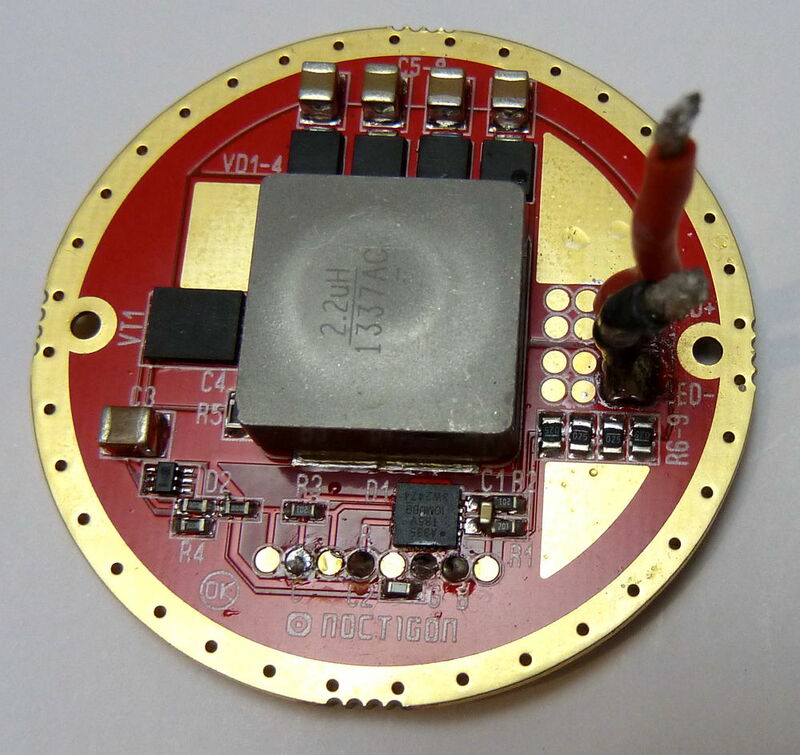 If you are not able to make boost driver design “from zero”, dont try to rechip meteor driver. You will get tons of issuies from hardware that you wont fix. I don’t want to change it, I just want to know how it works and which components are used. While I’m no pro, I still have a common understanding of power electronics and electronics design. Thanks, that’s a great info! If I see correctly this is some kind of driver the M43 is based on? Because the M43 is missing some redundant parts that allow for higher currents/faster switching. Yes, this is most complicated sample schematics that is allowed for sharing and making by yourself. The M43 code and driver schematic aren’t available, but the schematic above is similar and an older version of Indigo is available. It’s written in assembly. This may be enough info for someone motivated to fill in the gaps between what is available and what is not, but nobody has created any other firmware which can run on it. So, nothing Narsil-like on the Meteor. However, if you want the Meteor UI (er, UIs) on your Narsil light (Q8, GT, D4/D1/D1S, etc), that can be arranged. I implemented most of it one evening while cloning UIs for my new toolkit, and could probably finish the rest in a few hours if anyone wants it. My Meteor M43 Nichia 219C saved the day! Tonight was my daughter’s Homecoming dance and she had 16 of her friends come over beforehand. It was raining out so they couldn’t take pictures outside. When they gathered in the living room to take pictures, we were trying to figure out the best location, but the lighting wasn’t right. So I ran down stairs and grabbed my M43. I did a ceiling bounce in turbo and the pictures turned out great! There were lots of pictures, so in between pictures I cooled the flashlight with my hands. At times it got very hot, but it never shut down and kept providing great light. Some of the parents were quite impressed with the flashlight. This is the first time I actually felt justified buying such an expensive, but worth every dollar, flashlight. The m43 its sold out with all leds… Anyone can confirm? Well, at least that means I can see a cyan D4 coming my way! If I had already had a Q8 I would not have purchased an M43. Would have saved a bit of cash.